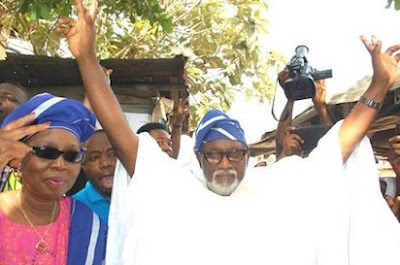 Ondo Election: The governorship candidate of the All Progressives Congress, Mr. Rotimi Akeredolu (SAN) who is yet to declared winner of the Ondo governorship election by INEC has sad that his ‘victory is of God through the people’ Ondo has decided and I am humbled that my people chose me. Our time to Think Anew and Act Anew has come. Thank You Ondo State.” Rotimi Akeredolu Ondo has decided and I am humbled that my people chose me. Our time to Think Anew and Act Anew has come. Thank You Ondo State. “I wish to express my profound gratitude, first, to the Almighty God whose infinite grace has allowed us to see this day.’’ “ This victory is of God through the people. It is not for me or the APC alone, it is a victory for the people of Ondo state irrespective of which side of the divide you stood during the election. “For me it is a challenge to perform. It is a call to rescue our state and reverse its fortunes.’’ He thanked the people of the state for their steadfastness. “I have heard their messages throughout the campaign to all the nooks and crannies of the state. Today, you have spoken with one voice. You have walked your talk. You have voted for me as your Governor for the next four years. “Today, Change has come. I hereby make a solemn pledge that this collective mandate shall address all issues with keen determination. The welfare of our people alone shall be the directive policy of the government. “Today’s victory is a confirmation of the willingness and readiness of the people of Ondo state to change and seek a better life. I thank you for your faith and confidence in me. I thank all those, whose uncommon sacrifices, contributed in no small measure to the success of the exercise. “A special show of gratitude must be extended to our security agents for their patriotic duty.’’ He appealed to everyone to embrace peace. He said that safety of lives and property of the people should be of paramount importance to all. “Let me use this opportunity to thank, profusely, the President and leader of our party, President Muhammadu Buhari, for his exemplary leadership. “I thank our indefatigable and principled party chairman, Chief Odigie Oyegun and members of the National Working Committee, APC Governors and Ministers who remained faithful to the Party for their unflinching loyalty.’’ He said that in a in few months, he would be saddled with the task of providing responsible leadership, a leadership that would take our people from poverty and stagnation to productivity and prosperity, from pains and lamentation to joy and laughter.